Businesses are increasingly using bots to engage with their audiences and for good reason. This is more than just a tool for sending customers branded messages. It has serious customer support, marketing, and sales potential. Here, we’ll explore Facebook bots, and how you can use this tool to connect with your customers. A Messenger bot is software that uses artificial intelligence to engage with users via Facebook Messenger. Thanks to machine learning, bots can be trained to provide customers with information, recommend products, answer questions, even complete certain tasks. The more they engage with customers, the more these bots learn. With natural language processing capabilities, these exchanges are more conversational than ever. Facebook Messenger bots for business are attractive to users because they allow users to get the information they need and complete certain tasks without having to open up or download an app and without having to go through cumbersome, customer service channels. There’s no denying that people prefer messaging as a means of communicating. In fact, people message twice as often as they call. Why not leverage that? Even better, why not take the most widely used social media platform, and combine that with a bot to maximize customer engagement? Message app use is expected to grow to more than 2.4 billion by 2021. Facebook bots certainly seem like the best place to start. Once you decide that building a bot is the best choice for your business, you’ll find that you have a lot of options for creating your own. These choices fall into one of two categories. Some people opt to develop their chatbots from the ground up. To do this, you’ll need to have development experience or hire someone who does. Most others use some sort of platform that allows them to develop bots without coding. The following assumes you are going to use a tool of some sort. There’s good news. You can learn how to build a Facebook Messenger bot in less than 30 minutes. No, it won’t be a fully functional bot that’s appropriate for e-commerce, customer service, or lead generation. However, it will give you something learn with, and demonstrate some of the capabilities of a chatbot. That’s helpful if you’re trying to get buy-in from company stakeholders. The first thing you will do is build your bot. In the case of Snatchbot, you’ll create an account and register. This will then give you access to your dashboard where you can create and configure your chatbot. The interface is designed for users who have little or no tech background. Depending on your needs, you will be able to select one of many templates upon which to develop your bot. You may also build one from scratch. Once you choose, you’ll build your chatbot by defining the ‘interactions’ that will take place between the bot and your customers. These are defined using simple if, then, else statements that you select. No coding is needed. 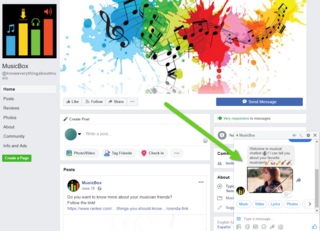 Once you’ve chosen your Messenger bot templates and developed your bot through the Facebook Messenger bot creator you have chosen, you’ll need to deploy it to your Facebook page. Of course, this means that you’ll need to have a business page on Facebook for your company. In Snatchbot, the places where you can deploy a chatbot are called channels. Facebook is one of the available channels. Once you select Facebook, you’ll have to go through some preparatory steps to connect your bot. These steps are defined by Messenger but they are not at all challenging. Once you’ve deployed, users will be able to access your Messenger bot through Facebook via the Facebook Messenger bot store, or through icons, you place in emails, on your website, or on social media. There are even Facebook Messenger codes that can be scanned to take customers directly to your Facebook chatbot. First, there’s a lot of noise on Facebook. It’s difficult to get your target audience member’s attention with paid ads and native content. There’s much less of that on Messenger. In addition to this, people are simply more likely to look at Facebook message than they are to read an email from your brand. There’s also the fact that answering a CTA in a message is usually easier than doing the same in an email. Messenger bots are also great lead identification tools. Your bots can engage customers with questions about their needs and preferences, then send the most qualified leads to your sales reps.
“If 24/7 availability simply isn’t possible with your human support and sales staff, a bot is an excellent substitute,” explains Veronica Wright, the Resumes Centre CEO. “Users can use the bots to get answers to basic questions, get product information and recommendations, check on policy issues, even make appointments. Even when live staff is available, bots can free them up for tasks that require a human touch,” she adds. Messenger bots can be a great customer re-engagement tool. Imagine sending a customer a message reminding them about items in an abandoned shopping cart. You could also send timely reminders and recommendations based on the customer’s previous transactions. Bots can also handle e-commerce transactions. Even better, they can do so without requiring users to exit Facebook Messenger. This removes a key point of friction that can lead to customers dropping out. Bots can also use the e-commerce process to add suggestions or upsell products. Of course, one of the key reasons for building a chatbot is to create something that interacts with your audience in a way that is on the brand. At the same time, you want to create interactions that are as effortless as possible. In fact, a Gartner study shows that ease of interaction may be a more influential factor for customers than creating a spectacular experience. A chatbot is perfect for that. You’ll need to develop a content persona for your chatbot. Then, you’ll need to do the actual work of developing the related chatbot content. No Facebook Messenger bot tutorial can tell you the persona that your bot should have. That’s something that must be based on your own branding and existing marketing strategy. A well-developed persona helps people to develop a sense of familiarity with your brand, and ultimately strengthens the relationship between your customers and your business. It’s imperative that your desired persona comes through clearly. Here are some guidelines for doing that. Your chatbot persona shouldn’t be ‘new’. It should be a continuation of the persona you present to your target audience through advertising and social media. In some cases, that persona will be representative of the owner or spokesperson of the business. In others, the persona is a reflection of the overall branding. If you have developed a branding persona or other guidelines, use this to determine your chatbot persona. If you haven’t, now is a good time to do that. Giving your chatbot persona a name doesn’t just make it relatable to customers, it helps writers to infuse it with the correct personality. Think of the overall tone of your social media posts, blogs, and other content. Use the same phrasing to maintain continuity. Ensure that anyone writing chatbot content is aware of the desired persona and has examples to work with. Use emoji and other visual content. This gives customers something interesting to look at and provides a break from all that text-only content that can be tiring to look at. Creating a chatbot persona should include creating some dialogue samples and catchphrases, or identifying those in existing content. This is where a good content writer and strategist can be a valuable asset. This work can be outsourced through content creation resources and can be facilitated by using the right collaboration tools such as Essay Supply or Google Docs. There’s a niche for writing chatbot content. It’s called conversational copywriting. The conversational copywriter on your team is the person who will work with customer support, sales, and other business areas to identify potential interactions that customers will have with your bot. They will then create scenarios, prioritize those scenarios, and build dialogues to support those scenarios. This is where the ‘If Then Else’ structure discussed earlier comes into play. The writer determines what the bot says in those situations. As mentioned a moment ago, what the bot says should be driven by its persona, but there are other guidelines as well. Chatbot content should be short and simple. It should address the customer directly. It should avoid sarcasm, and it should tread carefully when using humor. Chatbot content should also never be overwhelming. It should take things one step at a time, and ask for confirmation. Finally, chatbot content should always give users an out. That means ensuring that users know how to escalate things to a person. A company with a solid marketing staff that includes copywriters may be able to write and maintain their chatbot dialogue in house. Others might wish to seek out assistance from professional copywriting agencies or use content writing tools to help. Finally, here are some chatbot best practices to consider when writing chatbot dialogue. Ask customers for their preferences in order to provide a personalized experience. Be clear in explaining to customers exactly what they should expect from their interactions with your bot. For example, they shouldn’t expect Facebook Messenger bot payments capabilities from a bot that’s simply designed to provide some basic frontline question and answer support. Depending on your audience, you may also need to provide some education on how to use Messenger bots. Be brief. One of the driving motivators behind using a chatbot is to save time. Be honest. Let customers know when they are engaging with a bot. Then, be clear in how you intend to use any information that you gather from them. Give customers an option to unsubscribe. If you aren’t convinced, there are several great examples of Branded Facebook Messenger Bots. These showcase various brands that are using the Facebook platform along with intelligent chatbots to provide great user experiences and to remove any friction in that engagement. Is your audience on Facebook? Then take a look at these Facebook bot examples. Sephora has built and deployed the Sephora Assistant that engages with users on Facebook. The purpose of the bot is to give users a means to schedule in-store appointments directly from the Messenger app without needing to go to the company’s website or making a call. The bot uses GPS technology along with Facebook messenger to identify the user’s closest store, and creators have managed to condense the entire booking process down to five steps. The WSJ-chatbot provides users with custom curated news. This saves them time using Google or poring through the paper’s website in order to find content that is relevant to them. Users simply engage with the bot’s interface in order to state their preferences. The more they engage with the free Messenger bot, the more customized their newsfeed becomes. Much of the discussion around Facebook Messenger bots for marketing directly to consumers. MasterCard has created a Messenger app to facilitate their relationships with banks and merchants. The MasterCard chatbot uses natural learning processing. The bot supports payment transactions via integrations with the Masterpass payment service. MasterCard, one of the leading financial service providers, recognized the widespread adoption of chatbots and decided to implement its own on Facebook Messenger for both banks and merchants. This is exceptionally useful for merchants, as they can make use of this feature without developing any Messenger bots themselves. They’ve done something similar for banks as well. MasterCard customers can go directly to their banks via the chatbot to check account functions, track purchases, even request monitoring. Again, by providing this service, they help both their member banks as well as the customers. While other pizza places are creating apps for customers to use, Pizza Hut recognized the value of implementing a chatbot app. After all, who wants to download another single function app (ordering pizza)? Thanks to the Pizza Hut chatbot, customers can initiate, place, and complete a delivery order in just a few moments. Even better, the bot can engage with the person taking the order and potentially upsell the customer. The Whole Foods Messenger bot is quite simple but highly useful. The chatbot collects data from the user, then it uses that data to curate relevant recipes. These take into consideration a customer’s dietary restrictions, food preferences, etc. The bot also allows users to save recipes, link their loyalty cards, and much more. Marriott created a Facebook Messenger bot in 2016 with the purpose of allowing its customers to connect their Starwood and Marriott rewards account when both hotel companies merged. Over time, this bot was updated to allow customers to book rooms. The bot curates hotel recommendations based on city and date input. It also shares relevant content from the chain’s travel magazine, local news, and other information. In addition to their customer-focused chatbot, they’ve also developed and deployed a bot for job prospects. The bot assists job seekers who are looking for Marriott jobs in their cities. At the same time, it introduces those job seekers to Marriott's company culture, history, and corporate mission. It’s clear that a Facebook bot can be used to provide customer service, increase brand awareness, and connect with your customers in a way that simply isn’t possible using other venues. Not only that, building a Messenger bot is reasonably easy using the right tools. However, before making the leap, there are certain steps that businesses must take as well as the best practices they should follow. This includes creating a clear chatbot strategy, developing a chatbot persona that fits with your overall branding, and creating chatbot content that implements that persona while also meeting customers’ needs. Finally, Messenger bots should be deployed using best practices that enable your company to assist customers while using the information they provide to give better service, and drive leads. Amanda Sparks is a professional marketer and blogger. She's in charge of marketing strategy at Resumes Expert and Canada-Writers. Amanda is passionate about developing innovative and customer-friendly solutions for brands.